Tired of seeing this floppy hat yet? I love the 60s inspired wide brim and most importantly, the versatility of the hat. It'll definitely be making an appearance again so I hope you guys grow fond of it as much as I have! For this post, I was inspired by New York based designer, Nicole Miller's Wanderlust Fall 12 Lookbook. I added my own personal style to it, incorporating casual sunny Los Angeles influence. The tank has scoops down pretty low so I took the chance to show off the three strap bralette from Brandy & Melville. (Also, it's beyond hot in LA which means going out fully covered = impossible.) 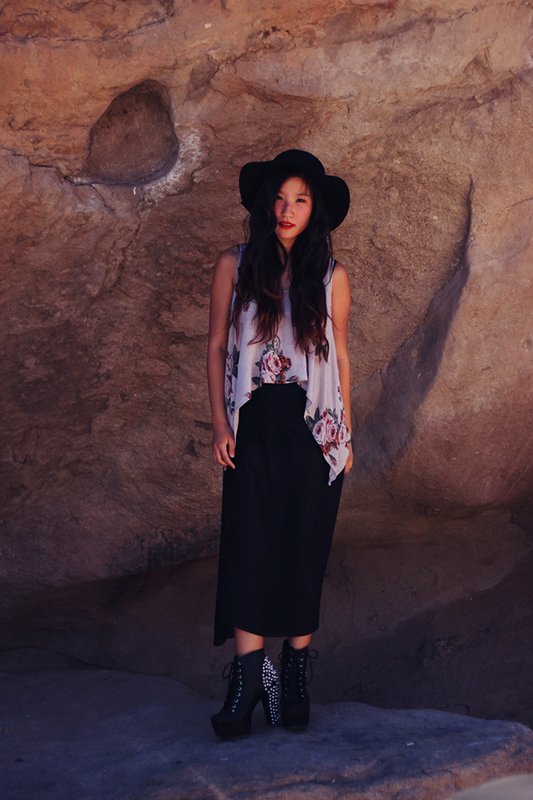 The eclectic vintage florals against the desert landscape definitely mesmerized the wanderlust within me. Looking forward to her Spring 2013 sci-fi collection! As September is rolling in, so are the exponentially increasing tweets about Fashion's Night Out and New York Fashion Week. In the documentary The September Issue, Candy Pratts says, "September is the January in Fashion." The anticipated week of magic in which designers display brilliant collections and new trends leaves you fueling with inspiration (and eventually empty wallets). Earlier this year, I was grateful and ecstatic to attend a couple shows for Los Angeles Fashion Week. It also served as a great learning experience and inspiration refresher for me. I was spellbound by the beautiful collections and the talent and dedication it took to put on the productions as I watched the runway. Being a blogger, I love that I can act as a voice to share fashion show coverage as well as show emerging designers with the readers and general public. One of my favorite parts about fashion week is style stalking. I love observing and being inspired by everyone's personal style. Street style has become just as important as the collections on the runway. It's almost like an unofficial fashion show itself! Everyone puts on their best for the shows as an hommage (and perhaps get photographed by The Sartorialist?) to fashion. It's fascinating-seeing how everyone's backgrounds and influences had an impact on their styles. I've continuously said this in my previous posts but I have met some of the most amazing and sweetest people at the events. Not only do we still keep in touch, but it adds so much to the experience. Bloggers, designers, editors, stylists, and fashion's biggest influences join together to celebrate Fashion Week. So what are you looking forward to most this September? Stunning photos! Love the shoes! Lovely outfit!And verry cole shoes! Is that your bra peeking out of your shirt? It's really cool! Beautiful photos, the outfit is great and I'm not tired at all of the hat, it looks great with the rest of the look. It's true having a blog gives a lot of work but it's so worth it! In September I'm looking forward for all the fashion shows and the new trends coming from them and also all the streetstyle photos of the people attending the shows. Love seeing the trends appearing from the streets, it's fascinating as you say. Absolutely love those pumps!! I've been wanting spiked ones for a while, but don't think I could pull it off. But you definitely do. (: You look great as always! words cannot describe how much I love this post! I love your outfit! Brandy Melville tanks are lovely. Great material and cute! and I love your edgy shoes too! this post kind of reminds of Lady GaGa's You and I MV! Hi, u have an amazing style. i love your Litas, theyre my dream shoes! i wana follow u but i cant find ur gfc so i followed u on bloglovin. wow, I love those pics! you are pretty awesome! the shoot is amazing :) i love your outfit :) feminine but with a grungy twist! Love your look! Your shoes are so cool! Just bought a pair of J.C.'s myself and I'm obsessed with them! Great blog btw! Would you like to follow each other? You look awesome ! Great boots! You have the most intense hair flips ever!! Absolutely STUNNING! god. those shoes are absolutely to DIE for! and I love your hair + lips combo, you're so beautiful! Beautiful photographs with a fascinating backdrop. Like a mini-editorial! I love that you made a scarf into a skirt. I always envy that sort of design creativity. Not a fan of the Litas personally. They're a bit too trendy for my taste, often overdone. But to each their own. u're very pretty! and i love ur heels! These photos are amazing! I love the scenery and your look! Looks like a photo shoot for a magazine! These photos are stunning! they have such an editorial vibe. I'm in love with that floral top and the fact that the skirt is a scarf is just genius. You look great! just found your blog today and i love it!! new fan. and i have that brandy melville bralette too! !